Palo Mayombe has a most sinister reputation. It is about the ‘darkest forms of black magic’ executed by unholy and sinister criminals that are solely using the nefarious and infamous nganga to do their evil desires. Since the ritual murders in the Mexican city of Matamoros two decades ago by a little band of drug dealers Palo Mayombe also entered as a shocking element in some horror movies. The palero is always depicted as a vile, arrogant and lost soul that communes with the most dirty and hostile of spirits. This image seems to be growing actually. The first book in English that treated Palo Mayombe was a chapter in Gonzalez Wippler’s 1973 book about Santeria, eternally reprinted since then. I believe it was with this book Palo Mayombe lost its autonomy. The fact that a great number of paleros were also santeros might have resulted in her informants resorting to the more well known Santeria to explain Palo Mayombe concepts. Still, her presentation contributed to a distorted understanding of Palo Mayombe. There was also the Kimbisa order developed by Andres Petit. The Kimbisa order utilized a well thought and intelligent syncretism which was not random or accidental in any way. Not only this, but most likely his Kimbisa order was developed from Palo already syncretised with Christianity in Africa. 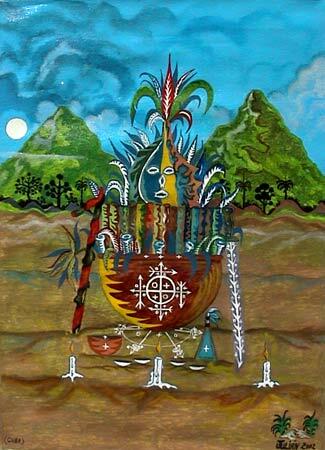 It is from Gonzalez Wippler’s work we have the idea of Palo Mayombe as ‘the dark side of Santeria’. Here she presents a cult of men lacking dignity that is just out to harm for harms sake. You are left with the impression that if you ever cross a palero you just made your worst mistake and opened the doors of doom! By presenting these sinister and amoral men in her book on Santeria and articulating it as the religions dark side she contributed to a misrepresentation. In spite of syncretism being popular nowadays Palo Mayombe has really very little to do with Santeria. It is an autonomous and independent cult/religion and not a sinister technology found in Santeria. The constant misinformation has in a wicked way been helpful in order to preserve Palo Mayombe under this veil of misinformation. At the same time quite a few individuals drawn to Palo Mayombe are dubious individuals that have embraced the sinister myth. It is almost like Palo Mayombe protects itself by misleading both those with vicious intent and those who are easily confused. It is a nocturnal cult and the lunar phases are often observed – and as with everything that takes its life and light from the night and the moon it is not so readily understood. Because in night is mystery and at night the world turns into ‘other’. Herein lays the soul of the cult. Palo Mayombe is about capturing the secrets of night in the cauldron of wisdom. It is the path of the warrior in its most chivalric and rustic sense. It is about bringing the light of death to blaze in the night upon earth and woods.